Oh Valentine's Day. A challenge for new couples and old ones alike. Usually, the perfect gift idea doesn't truly exist, regardless of how long you've known each other. Still, Valentine's Day is the perfect occasion to show your partner just how much you care. There are many ways in which you can surprise your significant other this year and put a smile on their face. Here, we've collected a few ideas for you to make this year even more special. A watch is an elegant gift to give regardless of gender. You can hardly fail if you give your partner a watch, especially if he or she is already wearing one. Who wouldn't want to alternate between a few styles of timepieces throughout the week, allowing you to pick and choose which watch matches your outfit every day. There are many different types and styles of watches you can choose for every budget level. From wallet friendly Quartz movements that tick and run on a battery, to more expensive Automatic watches that wind using the kinetic movement from your body to keep fully charged and accurate. Also keep in mind the style of watch band when shopping for a watch for your loved one. From sporty metal style bracelets, to a more elegant and dress calf or crocodile leather band that fits under a dress sleeve or cuff. The best part about this gift is that every time your significant other checks the time, they'll be reminded of you and that special Valentine's Day they received this special piece. Contrary to popular belief, perfume is not just something dedicated for women. First and foremost, the word perfume describes the strength of the fragrance. From eau de toilette to cologne, perfume is generally the perfect balance between longevity (how long the scent lasts on your skin) and sillage (the scents trail). From major fragrance houses, to niche boutique brands - the fragrance industry has something for everyone, young to old, men and women. When shopping for a perfume for your loved one, be sure to identify the notes both you and your partner enjoy in a scent and then explore. Almost all major drug stores, department stores, and beauty retailers offer a selection of men and women's fragrances to sample. Take your time to smell and determine which one would be most suitable as a gift for Valentine's Day. If you're lucky, you might just be buying your partner's signature scent that you (and they) will enjoy for years to come. Giving a gift that will help your partner's hobby is a very thoughtful thing to do. First of all, it shows that you care about what he or she is passionate about. Second, it will help your partner cultivate his or her passion even further. Of course, it doesn't necessarily have to be a hobby-related. A turntable, a pair of speakers, or a new flat screen can be awesome gifts that you can enjoy together. Also, can you think of any old gadget that your partner needs replacing (like an ancient smartphone they refuse to give up)? He or she will be very happy that you took notice and made their life a little bit easier. Sometimes, the best gift isn't a thing, but a memory-to-be, or an experience that you two will remember. It can be a trip to a glamorous spot where you will experience the romantic period of Valentine's Day at its best. Is it too soon to plan for a trip abroad? Try something relaxing, like a couple's massage in the city, followed by a bottle of wine at your favourite restaurant, or even a lovely meal prepared at home together. 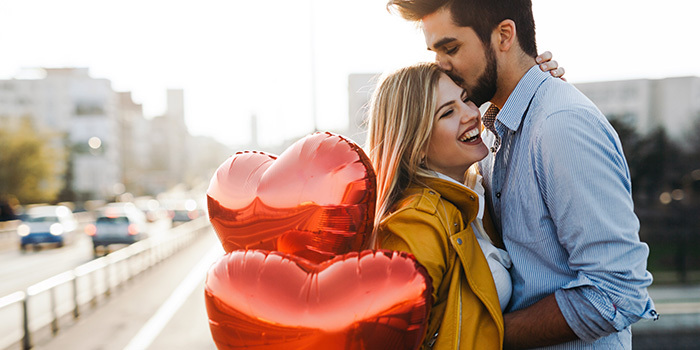 Valentine's Day is once a year, and you'll want to make the most of it. Your partner's happiness is your happiness as well, and everyone deserves a great gift that validates the love in the relationship.